This chapter mainly deals with the concepts of test method and response format. 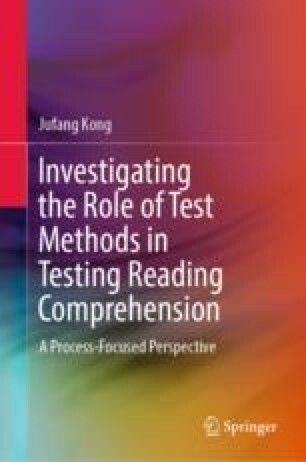 In this chapter, the two most widely used response formats in reading comprehension tests are revisited with their respective strengths and weaknesses outlined, i.e., multiple choice question (MCQ for short) format and short answer question (SAQ for short) format. These two response formats were adopted as cases to help investigate the test method effect(s) on reading comprehension test performance.